What Is Exfoliation, and What Does It Do for Your Skin? In simple terms, exfoliation is the removal of dead skin cells. An exfoliant is a product or procedure that reduces the amount of dead cell build-up on the skin. Your skin naturally exfoliates, or sheds dead cells, through a process called desquamation. But in people with acne, this natural process isn't working as effectively as it should. Dead skin cells are hanging around longer than they should, plugging up the pores and creating comedones. All pimples begin as comedones. Whether your acne is mild or more severe, regular exfoliation will smooth and soften the skin and brighten your complexion. It also helps reduce breakouts by keeping the pores from becoming clogged with the pus of dead cells and sebum (skin oil). But before you run out and buy an abrasive scrub, take the time to learn about all the exfoliating products and treatments available. Making the right exfoliant choice is essential for getting good results without irritating your skin and aggravating acne. There are literally hundreds of exfoliating products and procedures available today, but all are found in one of two forms: physical or chemical. You're probably most familiar with physical exfoliants. Physical exfoliants manually remove dead skin cells by use of an abrasive ingredient or implement. Gritty scrubs, rough cleansing pads and cloths, and professional microdermabrasion procedures are all examples of physical exfoliants. Physical exfoliants leave your skin feeling soft and smooth, but they often aren't the best exfoliant choice for acne-prone skin. The friction involved in using a physical exfoliant can irritate already inflamed skin. This rubbing and scrubbing can leave your skin looking redder and can make existing breakouts worse by irritating and exacerbating redness. The more inflamed your acne, the more you'll want to avoid physical exfoliants. If you have inflammatory acne, you should avoid physical exfoliants altogether unless otherwise advised by your doctor. Chemical exfoliants work without abrasive agents. Instead, chemical exfoliants dissolve or loosen the bonds that hold dead cells on the skin's surface by means of an acid or enzyme. 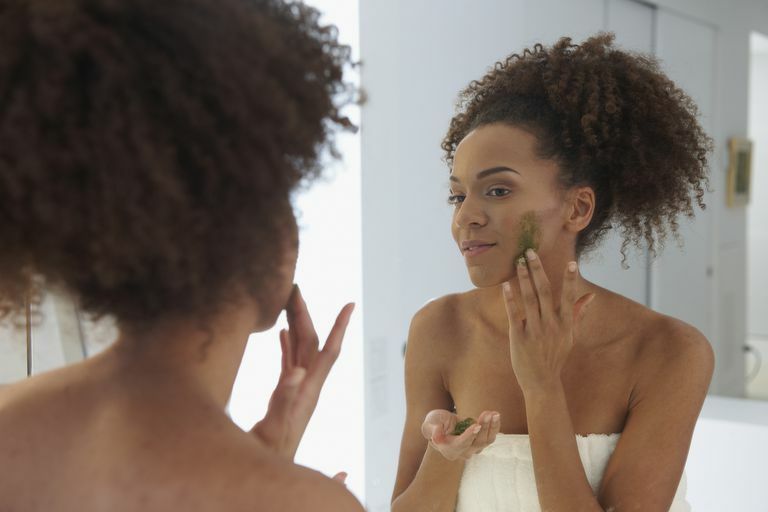 Even if you weren't familiar with the term "chemical exfoliant," you're probably familiar with the products or procedures. You've most likely used some before too. Over-the-counter chemical exfoliants can be found at your local retail store, and many are gentle enough to be used daily. OTC glycolic peels, for example, are very popular at-home chemical exfoliants. Stronger treatments, like salicylic acid peels, are available at day spas and skin spas. The estheticians working there can help you decide which treatments will be best for your skin. For the most powerful chemical exfoliant products, ask your dermatologist. He or she can provide you with a prescription medication like topical retinoids, or perform stronger chemical peels if needed. Most chemical exfoliants, whether over-the-counter or doctor prescribed, will dry the skin to some degree. Incorporating an oil-free moisturizer into your daily skin care routine will help ward off excessive dryness, peeling, and irritation. If you need help choosing an exfoliant, don't hesitate to ask your dermatologist for guidance. Your doctor will be able to recommend a product or procedure that is both safe and effective for your skin. Unless recommended by your doctor, avoid using several exfoliating products at the same time. Doing so may cause redness, excessive dryness, peeling, and considerable irritation. Remember, too much of a good thing is too much. If you are currently using any acne medications, especially isotretinoin or topical retinoids, talk with your doctor before beginning any exfoliation treatment. In fact, if you're seeing a doctor for any skin issue, you should get her OK before making any changes to your skin care routine. Exfoliation is a beneficial part of any skin care routine. With regular exfoliation your skin will look brighter, and feel softer and smoother. It can also help clear out your pores, and reduce breakouts. Some exfoliating products can help improve signs of aging too. Zaenglein AL, Pathy AL, Schlosser BJ, Alikhan A, Baldwin HE, et. al. "Guidelines of Care for the Management of Acne Vulgaris." Journal of the American Academy of Dermatology. 2016;74(5):945-73. Tang SC, Yang JH. "Dual Effects of Alpha-Hydroxy Acids on the Skin." Molecules. 2018 Apr 10;23(4). pii: E863. Lee CM. "Fifty Years of Research and Development of Cosmeceuticals: a Contemporary Review." Journal of Cosmetic Dermatology. 2016 Dec;15(4):527-539.